For the third off-season in a row, the New England Patriots are coming off an appearance on the game’s grandest of stages. The Patriots are two for three in the last three Super Bowls, their most recent triumph the lackluster 13-3 win over the Los Angeles Rams. Make it two off-seasons in a row now, however, where New England has done anything but inspire confidence in its ability to return to the top once again. True, it didn’t matter one iota last year. The talent exodus from Foxboro last March included Danny Amendola, Nate Solder, Malcolm Butler and Dion Lewis, among others, not to mention defensive coordinator Matt Patricia. The Patriots were still the last team standing. Video2019 NFL Win Totals: Will Patriots Go Over, Under Las Vegas' Number? Flash forward to the spring of 2019, and it’s been good-bye to Trey Flowers, Trent Brown, Rob Gronkowski (for now) and once again, the team’s defensive coordinator in Brian Flores. Even the departures of some depth pieces, be it LaAdrian Waddle or Cordarrelle Patterson, sting more than they should, based on who’s been brought on to replace them. At what point does the talent drain catch up with New England? Brown wound up filling in admirably – maybe even serving as an improvement – for Solder at left tackle. He followed Solder’s footsteps out the door, becoming the highest-paid tackle in NFL history just like his predecessor. The Patriots plugged and played Matt Light way back when and that worked out pretty well for over a decade until Solder was ready. Is that the approach now for Isaiah Wynn, the team’s top draft choice in 2018 who missed the entire regular season due to a torn Achilles? It’s risky business to leave a soon-to-be 42-year-old quarterback with a de facto rookie protecting his blindside, but riskier yet to leave him with a soon-to-be 33-year-old receiver as his top target in the passing game. Tom Brady and Julian Edelman have and will continue to mask deficiencies in the passing game, but the re-signing of Phillip Dorsett wasn’t even so much of a necessary move as the only move the Patriots could have made. Seriously, check out the résumés of imports Bruce Ellington and Maurice Harris. They aren’t pretty. The only thing surprising about Gronkowski’s retirement was the timing, given it perhaps left New England in limbo a bit as it struck out on pretty much every top-end free agent pass catcher available. 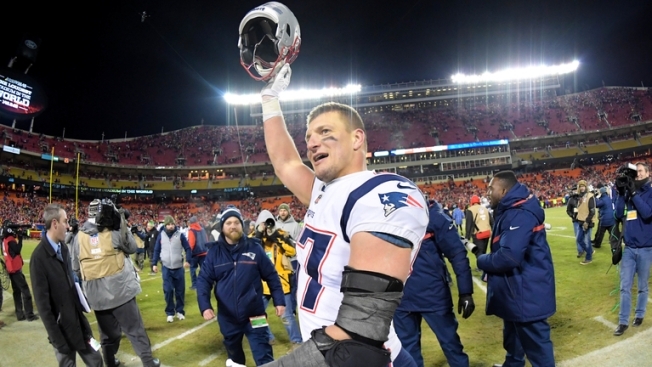 Whether Gronkowski ultimately stays retired or not, the Patriots have to operate under the assumption he’s not coming back. The tight end depth chart is so barren it makes the departure of Dwayne Allen, he of the three catches in 2018, feel almost catastrophic. Almost. Flowers became the latest in a long line of promising young defensive players in New England to fly the coop to paydays elsewhere, following Butler, Jamie Collins and Chandler Jones in recent years. Similar to replacing Butler last year with Jason McCourty, the Patriots did turn to the brother of another player with some familial ties to Foxboro in Michael Bennett to help replace Flowers. The approach in each of the last two off-seasons varies greatly from that of 2017, when the Patriots, coming off victory in Super Bowl LI, partied like it was 2007 and loaded up with the acquisitions of Allen, Stephon Gilmore, Brandin Cooks, Mike Gillislee, Rex Burkhead, Kony Ealy, Lawrence Guy and David Harris. Much like in 2007, the Patriots held a lead in the fourth quarter of the Super Bowl only to come up short. No one approach to the off-season is perfect, nor should the same approach be applied every year. Even if New England came up short in 2017, the moves to bring in Gilmore, Cooks, Burkhead and Guy worked out beautifully. Think there’s any buyer’s remorse on Randy Moss or Wes Welker in ’07? Still, a talent exodus is never a good thing, no matter who your quarterback and head coach are. But it’s true: Tom Brady and Bill Belichick always have and likely always will have the Patriots at the forefront of contention until they walk away. Did Belichick scope the landscape around the AFC and sense rivals such as the Pittsburgh Steelers and Baltimore Ravens in transition? How much did any of the AFC South contenders really improve in March, particularly the Houston Texans and Indianapolis Colts – two teams the Patriots own like few others? Are we sure the Kansas City Chiefs, perhaps a coin toss away from a Super Bowl berth, got better by parting ways with veteran defenders for the second off-season in a row, this time Eric Berry, Dee Ford and Justin Houston? Are the…Cleveland Browns a contender? The Patriots have controlled the AFC for nearly two decades and have won it in four of the last five seasons. Trips to the Super Bowl in 2013 and 2015 were thwarted by a Peyton Manning-led team, and no one has challenged the throne since Manning retired after the second meeting. Without a rival team in the AFC showing surefire signs of improvement, the status quo might not be the worst thing in the world after all.